The origins of the Wagga Iron Foundry go back to 1913 when a Riverina blacksmith began casting parts for agricultural machinery behind an engineering works in Wagga Wagga. The foundry grew, and was succeeded by several owners who worked through the Depression and both Wars keeping the small business operating for the local rural community. One owner was a Wagga man called Mr. Lamprey. He became famous by casting himself aluminium teeth. He wore them for years - a credit to his foundry skills and marketing flair! In 1939 a Melbourne-born moulder called Jack Hanks bought the foundry and built up a solid business casting plough shears, gears and sprockets. In 1962, he was joined by a partner, Robin Lindsay who carried on the business until 2002. The Wagga Iron Foundry still maintains traditional moulding skills that have made them famous for excellent heritage castings. 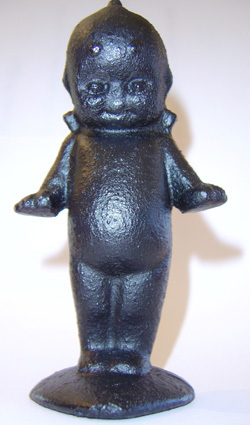 The Museum of the Riverina is aiming to collect contemporary items from Wagga Wagga, the first of which was this cast iron paperweight, in the form of a kewpie doll. Marketed as a 'Wagga Bush Baby', it is manufactured in a mould, front and back. The baby stands on a heart shaped base, and is painted in a range of colours when finished. The history of this item is shrouded in mystery, with many theories of its origins circulating. These include links with the Kewpie doll craze of the early 20th century, an association with Charles Kingsley's Water Babies book, and it has even been suggested that the baby represents the Tichborne Claimant, as evidenced by its round belly! The answer may never be known, but this item continues to be manufactured as a popular local souvenir.